click on any image below to enlarge, or click here for a zip file containing images suitable for media purposes. (http://texassuperstar.com/plants.html), introduced, have made their place in Texas landscapes because of the extraordinary bloom display or fruiting ability they provide in Hellish Texas growing conditions. The variegated tapioca (known botanically as Manihot esculenta 'Variegata') will join the SuperSun Coleus as a non-blooming plant which provides a tropical flare to summer landscapes with its vivid chartreuse/yellow variegated foliage. It is so spectacular that it is listed on the Mercer Arboretum Inbloom webpage for June at: http://www.hcp4.net/mercer/inbloom/june/ even though the blooms are not pictured. 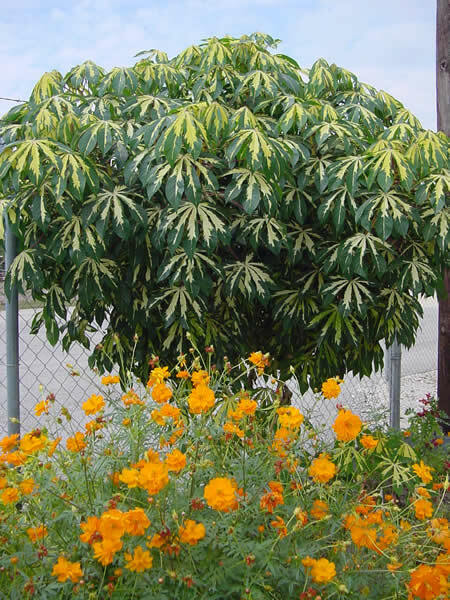 It bears spectacular leaves with creamy-yellow centers and carmine-red petioles (leafstalks). 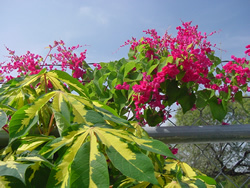 This tropical member of the family Euphorbiaceae can grow to be a large shrub or small tree in the tropics, but is useful in Texas as a festive summer annual or patio plant. One gallon plants can easily grow to be handsome 4 feet to 6 feet rounded mounds in a single growing season so young plants should be spaced 4 to 6 feet apart. 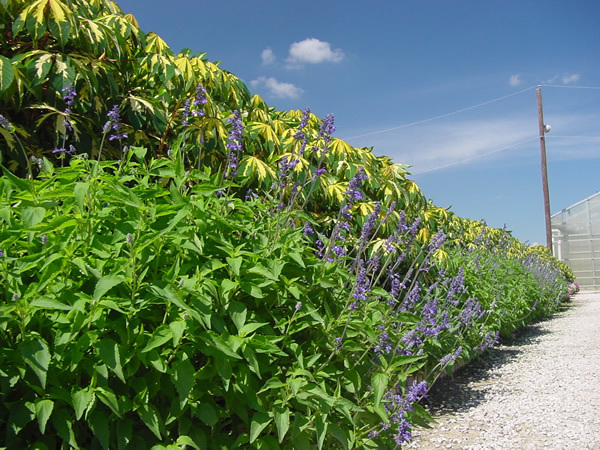 Plants are initially upright growers becoming wider as the season progresses. The rubbery textured bold leaves can reach up to 8 inches long and are lobed. New growth is a handsome reddish pink and the lobes mature to sport white, creamy white, to yellow-green variegated splotches that follow the main veins. 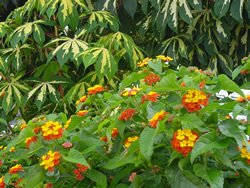 You don't have to worry about variegated tapioca "going out of bloom". 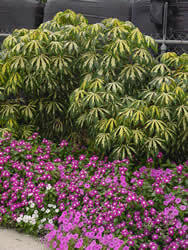 Instead, the plants offer foliage as colorful as most flowers with the added advantage of providing a show all summer. 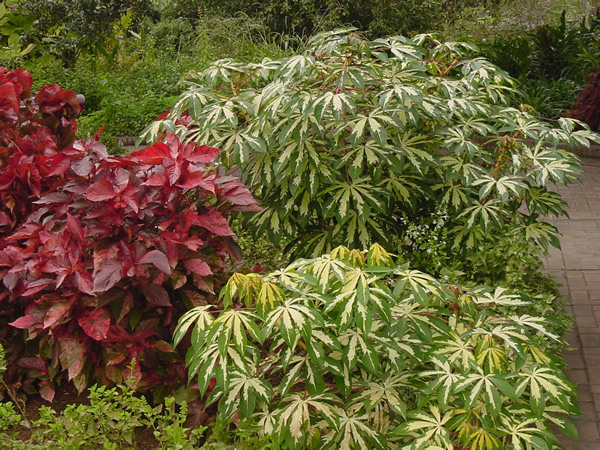 Note the scientific name of this selection is 'Variegata' because of its variegated leaves. The common Tapioca which is native to South America (Brazil and Paraguay) has green leaves. Often this variegated form will have a green sprout or shoot appear. 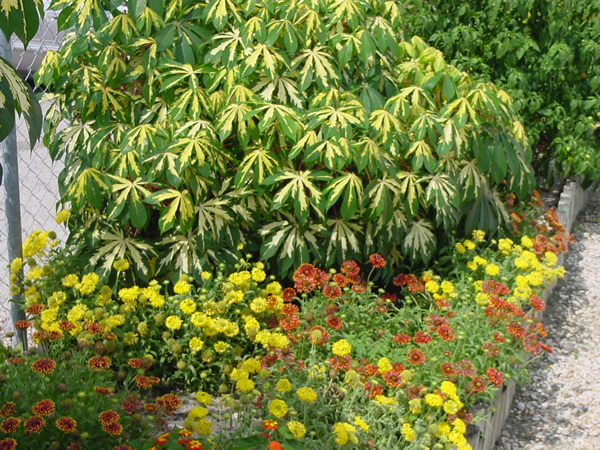 Any green shoots or foliage should be removed immediately or it will become dominant over the variegated foliage. 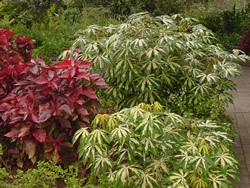 The normal, green form of this plant will also grow much faster and larger than the variegated form. The 'Variegata' screams "fiesta" in the summer landscape and it is one of the few variegated plants on which the foliage will not be damaged by intense, direct summer sunlight. Plants work great as centerpieces where taller plants are needed in the center of circular plantings or as backgrounds for lower growing annual bedding plants. 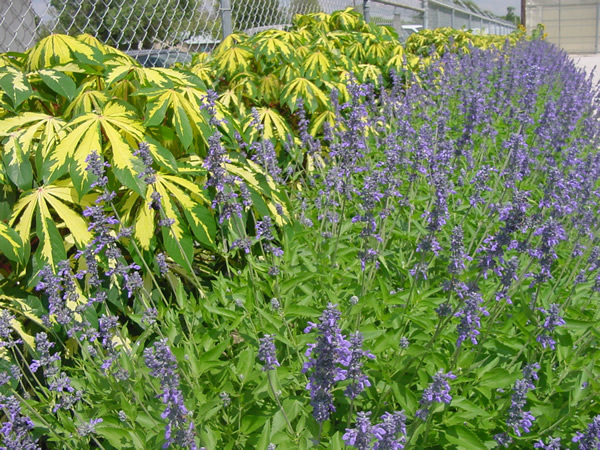 Perhaps the premier use of this variegated plant is as a patio or dooryard container specimen where it thrives despite the reflected heat from concrete or pavement. Variegated tapioca is a heat lover being from South America and does not grow vigorously until night temperatures are warm in spring In fact the foliage will exhibit chilling injury when night temperatures dip much below 50 degrees F. As long as it is hot, variegated tapioca will thrive in most any well drained soil or container potting mix, tolerating a wide range of pH. 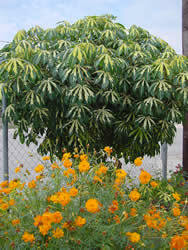 Variegated tapioca responses to supplemental fertilization of a side-dress application (one cup full distributed evenly around the plant) of a slow-release formulation every month and weekly irrigation in lieu of rainfall-- the soil should be constantly moist and mulch should be used. Plants will grow just as well in alkaline (South central Texas) soil as they will in acidic (East Texas) soils. They are somewhat tolerant to foliar salt exposure in the Coastal Bend area. 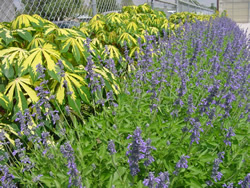 Full sun brings out the best foliage color, but plants will tolerate partial shade although the foliage will be less dense and not as vibrant in color. Avoidance of over-watering is critical to success-this is NOT a swamp plant. 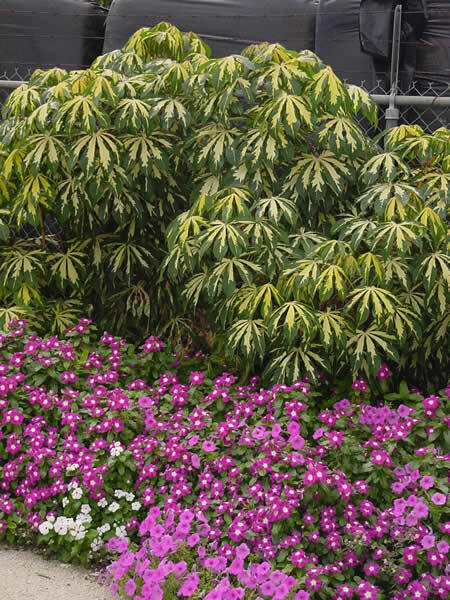 Variegated tapioca offers a bold exciting tropical addition to our summer palette of annuals used for foliage color in Texas. 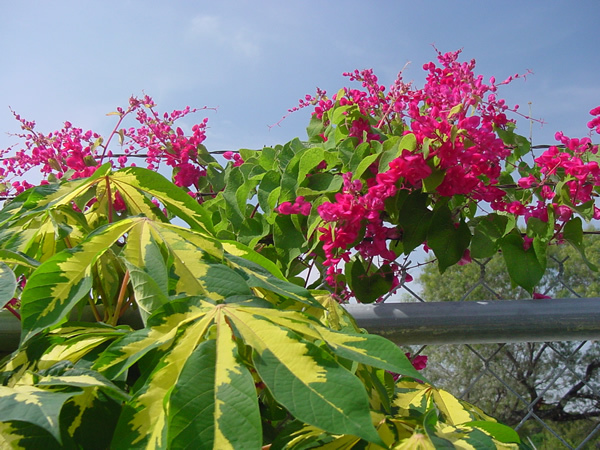 This plant has been used at one time or another in every major Botanical Garden in Texas. The first planting I was impressed by was at Stephen F. Austin and planted by Greg Grant. I later learned that Paul Cox had used it at the San Antonio Botanical Garden in the 1980's. Try some this summer and enjoy the foliage of South America.